Created by driving enthusiasts for driving enthusiasts, the dramatically styled 2016 Nissan Maxima looks like nothing else on the road today – and drives like nothing in the segment. 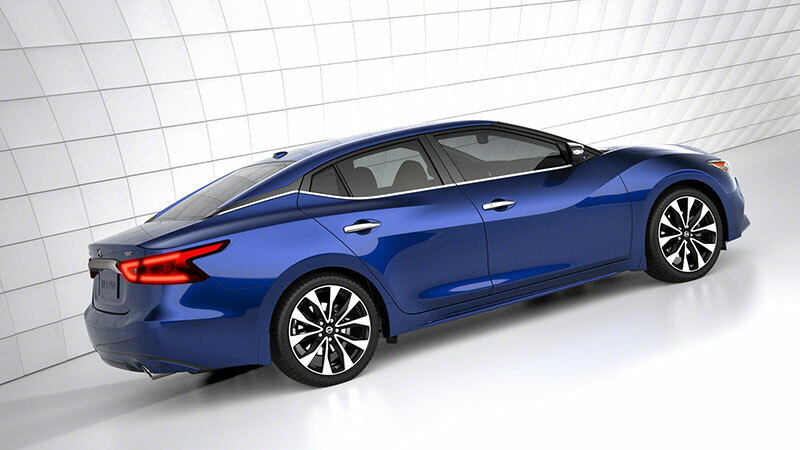 The all-new Nissan flagship not only resets Maxima’s iconic “4-Door Sports Car” positioning, it sets a new standard for style, performance and technology in the large sedan segment. Now offered in five grade levels, including new SL, SR and Platinum grades, the 2016 Maxima goes on sale at Nissan dealers nationwide in summer 2015. A virtual clone of the stunning Nissan Sport Sedan Concept, the new Maxima is 1.3 inches lower and 2.2 inches longer than the previous generation design. It is also lighter and offers greatly increased torsional rigidity, all of which help Maxima push the performance envelope in its segment. While the new Maxima’s exterior projects a distinctive upscale look through its lower profile and wide stance, the heart of this newest generation 4-Door Sports Car is its completely revised 300-horsepower 3.5-liter VQ-series V6 engine and new performance-oriented Xtronic transmission. The engine utilizes more than 60 percent new parts (compared to the previous generation 3.5-liter V6), applying lessons learned from the Nissan GT-R such as sodium filled valves, to achieve a high specific output of 85.7 horsepower/liter. Torque is rated at 261 lb-ft. The comprehensive re-engineering effort also resulted in a considerable 15 percent increase in highway fuel economy, to an estimated 30 miles per gallon***. City fuel economy is estimated at 22 mpg. Well-matched to the new powerplant is a new Xtronic transmission, which, with its lack of fixed ratios, affords the specific advantage of always being in the right gear at the right time. A wider gear ratio range allows for stronger acceleration from a standing start and an all-new D-Step shifting logic allows rapid shifts at high throttle openings. An all-new shift logic holds rpm when it detects high-G cornering, allowing for seamless re-acceleration on corner exit. The all-new Maxima also features for the first time a Drive Mode Selector (Sport and Normal modes) that adjusts throttle response, transmission tuning, steering feel and Active Sound Enhancement tuning. In Sport mode, the engine throttle response increases, the Xtronic transmission programming changes for more aggressive shifting under braking and gear holding, the steering weight increases and the Active Sound Enhancement system further amplifies the engine note in the cabin. The foundation for the new Maxima’s enhanced handling and ride comfort starts with a redesigned platform that features increased use of high strength steels, including the first use of 1.2GPa high strength steel in a Nissan sedan. This allows the 2016 Maxima to not only boast a 25 percent improvement in torsional rigidity, but also contributes to an 82-pound weight reduction (versus the previous generation), giving Maxima a better power-to-weight ratio** than a BMW 335i or Acura TLX V6. The suspension is an independent subframe-mounted strut/coil spring design in front. In the rear is an independent multi-link double wishbone design with ZF Sach dampers. The rear dampers features a monotube design, often found in performance applications, for enhanced performance and fade resistance. Large stabilizer bars are found front (26.0 mm) and rear (26.5 mm). Responsive braking is provided by 4-wheel power-assisted vented disc brakes, standard 4-wheel Anti-lock Braking System (ABS), Electronic Brake force Distribution (EBD) and Brake Assist. Steering is provided by a vehicle speed-sensitive hydro-electric power-assisted steering (HEPS) steering system. Maxima comes with standard 18-inch machined finish aluminum-alloy wheels with painted inserts and 245/45R18 all-season tires. For the ultimate 4-Door Sport Car enthusiast, the new SR trim was conceived with the specific goal of pushing Maxima’s performance boundaries further than ever before. The Maxima SR-exclusive hardware starts with unique suspension damper tuning and a larger front stabilizer bar. Monotube rear dampers, which provide better high-temperature fade resistance than twin-tube designs and are typically found on higher-end sports cars, were originally specified for the SR grade only. The development team found that the benefit of the monotube dampers was so significant that the damper design was carried across to all grades of Maxima. The Maxima SR-exclusive performance upgrade also includes a segment-first Performance Chassis Damper, which is installed on the front section of the chassis to help quell high frequency vibration in the body that can result from the stiffer suspension. A similar damper is used on the Nissan 370Z NISMO. In addition, the Dual Panel Panoramic Moonroof offered on Maxima SL and Platinum grades was eliminated to help lower the SR’s center of gravity and further enhance torsional rigidity (versus moonroof-equipped models). And, along with special Alcantara® seating inserts and steering wheel insert for high-grip at key touch points, Maxima SR’s Integrated Dynamic-control Module (IDM) system adds a completely new element of electronic chassis management to the Maxima. For example, Active Ride Control (ARC), a feature within the IDM system, uses targeted brake applications after the vehicles encounters a bump or undulation to immediately improve the level of the body, allowing the SR to offer a ride quality that defies its sporting intention. While a groundbreaking presence is exactly what you’d expect of a sports car wrapped in a 4-door sedan body, Maxima’s global design team went far beyond expectations. In order to design a groundbreaking sports sedan, Nissan designers visited the U.S. Navy’s Blue Angels®****. The cockpit design of their aircraft is echoed in the wrap-around design of the Maxima. Externally, Maxima is lowered, sculpted and streamlined to achieve a sweeping aerodynamic profile that has more than a little jet fighter to it. To bring all this inspiration to life, a special metal stamping technique was developed, adding the distinctive powerful gesture to its bodyline and deeply scalloped doors. Back on the ground, Maxima’s bold front end combines Nissan’s signature V-Motion grille and new lighting features, which add to its defining presence on the road. The boomerang-style headlights include standard LED Signature Daytime Running Lights. In the rear, two-piece taillights with their own integrated LED signature complete the distinctive lighting theme. Maxima’s highly distinctive profile comes from its floating roof appearance with blacked-out A-pillars similar to the Nissan GT-R. Combined with the same blackout treatment applied to the B and C pillars, it creates a wraparound canopy appearance. The 2016 Maxima’s canopy look is accented with an available Dual Panel Panoramic Moonroof (standard on SL and Platinum grades), which gives front and rear occupants an uninhibited view of the sky above. The futuristic appearance is finished off with large dual exhaust chrome tailpipe finishers and 18-inch machined aluminum-alloy wheels. Maxima SR adds 19-inch aluminum-alloy wheels that use a unique a diamond-cut machined finish. 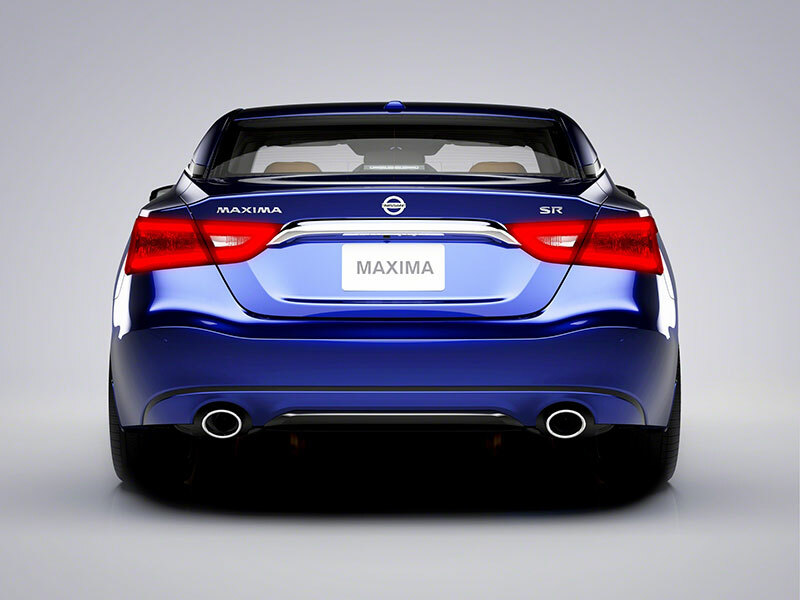 One of the most unique design aspects of the new Maxima is the “4DSC” embossed within the taillights and headlights, a subtle reminder of Maxima’s signature 4-Door Sports Car heritage. 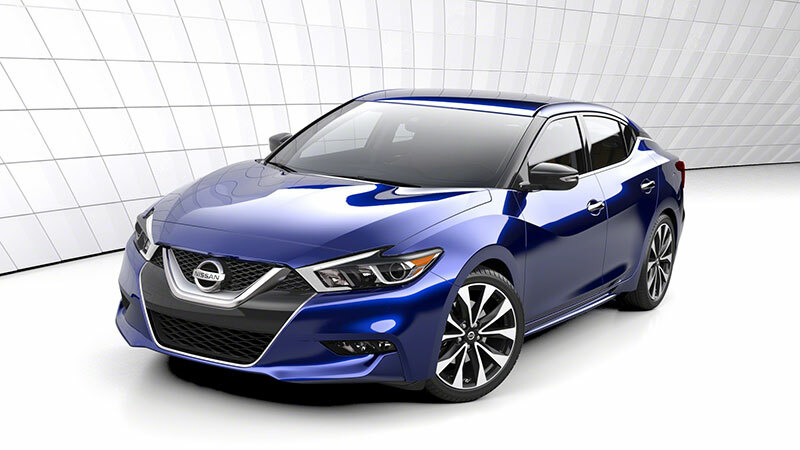 The new Maxima is available in nine exterior colors: Bordeaux Black, Storm Blue, Super Black, Brilliant Silver, Gun Metallic, Pearl White, Deep Blue Pearl and two Maxima-exclusive exterior colors – Forged Bronze and Coulis Red. Maxima’s totally redesigned interior is anchored by a “command central” driver’s cockpit and a premium bespoke style crafted execution. The focus on the driver begins with a center stack angled seven degrees toward the driver (a lesson learned from the legendary GT-R) and a floating console that sits higher than the previous generation Maxima design and puts key controls within easy reach. For example, the standard Nissan Intelligent Key™ start switch is now located on the console and pulses when the driver enters the cabin. The console also features luxurious padding on the sides with contrasted stitching. A new Display Commander control on the console allows fingertip control of the center display as befitting a premium sport sedan. Maxima’s interior execution was a strong focus from the onset of development, with the goal of offering an interior that truly rivals luxury vehicles. It offers genuine stitching on the instrument panel, doors and console, available ambient lighting, available premium Ascot leather seating surfaces with diamond-quilted inserts, unique faceted finishers and a sporty D-shaped (flat-bottom) steering wheel. The team even turned to unique material choices like Alcantara®, typically found on high-end exotics, to deliver on the premium promise. Nissan’s unique Zero Gravity front seats with sport bolstering are standard (8-way power-adjustable driver’s seat and 4-way power-adjustable front passenger’s seat) and offer increased softness provided by a new three-layer foam design. They are offered in premium cloth, leather-appointed or premium Ascot leather-appointed seating surfaces. Heated and Climate-Controlled front seats and steering wheel are available depending on grade level. The rear seat now features a standard 60/40 split fold-down design. As with the exterior, interior colors were carefully considered to fit with Maxima’s exclusive sports-premium personality. While most large sedans stick with black and beige motifs, the new Maxima SR is offered with an additional deep, rich Camel interior. Even the standard Charcoal color seating features blue contrasting stitching and the Cashmere (beige) seat color is lighter than usual, offering a higher contrast with the black surface areas. 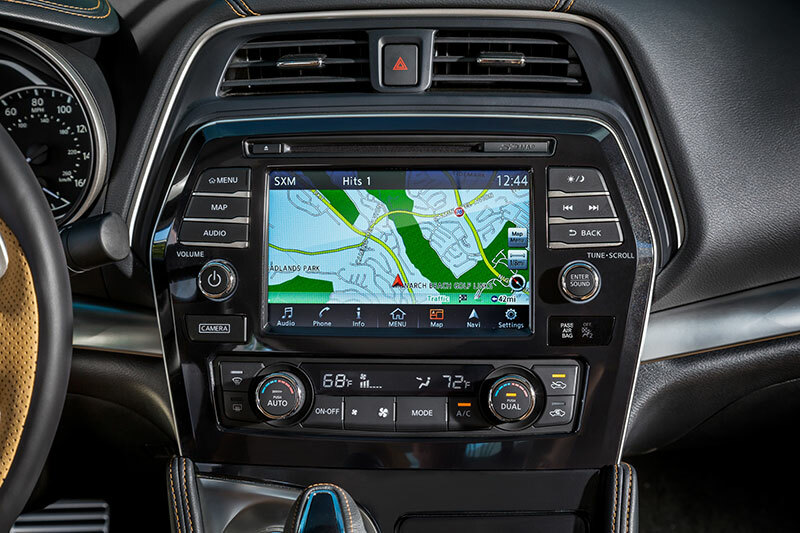 Maxima’s next-generation premium-level technology features include NissanConnect with standard navigation on all trim levels. The 8.0-inch color display features multi-touch control for intuitive smartphone-like gestures such as swiping and pinch-to-zoom. Hands-Free Text Messaging Assistant (Android only) and Nissan Voice Recognition for navigation and audio are also standard. Along with SiriusXM Satellite Radio and SiriusXM Travel Link™ applications (Sirius XM subscription required, sold separately), Online Search with Google® and other connectivity features, the system is paired with an also standard 7.0-inch Advanced Drive-Assist™ Display (ADAD) within the instrument cluster. The ADAD display was a specific focus during development. Two screens in particular were developed including a Home screen that shows navigation routing, digital speed and audio information on the same screen, giving the driver all requisite information at a glance without having to scroll through separate screens. A Sport screen offers the Maxima driver a unique “Power” meter, which shows actual engine output, flanked by gauges that display oil pressure and transmission oil temperature respectively for the discerning enthusiast. Swipe-to-Navigation is another hidden feature this system offers, allowing the driver to set a route on the navigation screen and the swipe towards the ADAD to bring up the directions. The available 11-speaker Bose® audio system was developed to deliver the ultimate premium audio experience befitting Nissan’s flagship sedan. The development team benchmarked luxury sedans several classes above Maxima with the goal of delivering the highest audio fidelity experience in the segment. Enhancements (versus the previous generation audio system) include a more optimal placement of the tweeters to enhance staging, addition of more speakers and introduction of new sound processing technologies. These technologies include Bose® Center Point® Surround Stage technology, which can deliver a surround sound experience from even a two-channel audio source, and a driver’s seat optimization mode that allows for a driver-centric audio stage. All Maximas are equipped with two USB inputs with music playback capability enabled through either port. These ports are housed in the media bin on the console, which is large enough to fit an iPhone® 6 Plus. Maxima’s luxury-level interior quietness is enabled by the application of laminated glass, not only on the windshield but also on the front door windows – the latter being a hallmark of upscale luxury vehicles. An Active Noise Cancellation (ANC) system works much like noise cancelling headphones and helps reduce unpleasant low-frequency sounds (available with Bose® audio system only). All the efforts to quell unwanted noise simultaneously introduced a new issue – how to ensure an authentic engine note in the cabin during spirited driving, as would be expected by the Maxima owner. The solution was the all-new Active Sound Enhancement (ASE) system that works by enhancing existing engine sound from the legendary VQ35 V6 powerplant into the cabin, delivering a stirring experience. Engaging “Sport” mode takes the stirring engine note a step further with the system allowing even higher engine note amplitude in the cabin. Convenience features befitting a luxury vehicle are part of the Maxima’s suite of available equipment. Many of these features are not even offered on many luxury nameplates and are found standard on various Maxima trims. These include a power tilt/telescoping steering wheel with an “Easy Entry” system, heated steering wheel, Around View® Monitor, Remote Start via Key Fob and a power rear sunshade. Available NissanConnect Services powered by SiriusXM feature emergency preparedness, remote access, customizable alerts and concierge services (subscription required, sold separately). The system, which is offered on Maxima Platinum with a six-month free trial subscription, allows the driver to set customized alerts for family and friends – such as speed, curfew and boundary notifications. The new 2016 Maxima offers an extensive range of safety, security and driving aids – many included as standard equipment (depending on grade level). For example, Predictive Forward Collision Warning (PFCW), Intelligent Cruise Control (ICC), Forward Emergency Braking (FEB), Rear Cross Traffic Alert (RCTA) and Blind Spot Warning (BSW) are all standard equipment on the SL, SR and Platinum grades. Additionally the Maxima Platinum grade features Nissan’s innovative Around View® Monitor with Moving Object Detection (MOD) that provides a 360-degree “surround view” of the vehicle. Maxima Platinum also offers standard Driver Attention Alert (DAA) system*****, which helps alert the driver when drowsy or inattentive driving is detected. Studies have shown that drowsy driving is involved in as much as 21 percent of fatal car accidents (Automobile Association of America Study, Nov. 2014). The Driver Attention Alert system provides an audible and visual warning if the system judges that the driver may not be attentive (using analysis of steering inputs to detect changes in the driving behavior). Maxima comes equipped with standard Nissan Advanced Air Bag System (AABS) for the driver and front passenger seats, which includes supplemental front air bags, seat belt sensors and an occupant classification sensor (for the front passenger seat), front seat-mounted side-impact supplemental air bags and roof-mounted curtain side-impact supplemental air bags with rollover sensor for front and rear outboard occupant head protection. Also standard are 3-point rear seat belts for all seating positions, front seat belts with dual pretensioners, load limiters and adjustable upper anchors, emergency inside trunk release, Zone Body construction with front and rear crumple zones, LATCH (Lower Anchors and Tethers for CHildren) and Tire Pressure Monitoring System (TPMS) with Easy-Fill Tire Alert. Maxima also features standard Vehicle Dynamic Control (VDC) with Traction Control System (TCS). 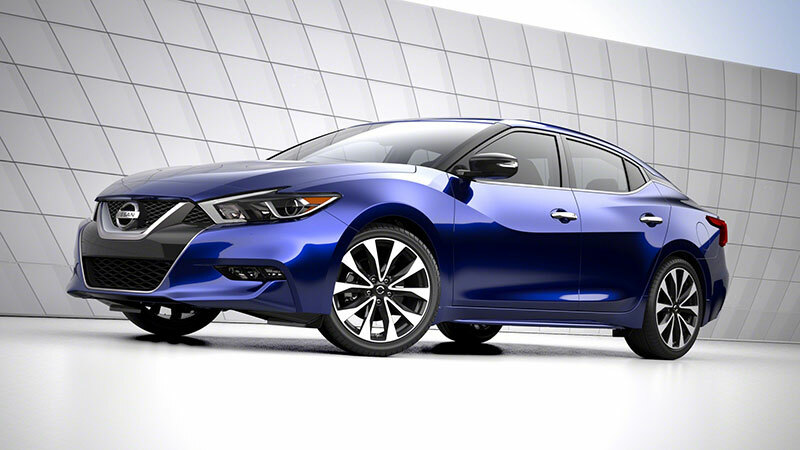 The 2016 Maxima is available in five well-equipped models: Maxima S, SV, SL, SR and Platinum. All equipment is grade standard and no options are offered, simplifying ease of finding the ideal Maxima for customers’ needs and desires. The Maxima S includes standard NissanConnect navigation with 8.0-inch display paired with the 7.0-inch Advanced Drive Assist Display in the instrument cluster, Remote Engine Start via Intelligent Key, Dual USB ports, SiriusXM Satellite Radio and SiriusXM Travel Link™ applications (Sirius XM subscription required, sold separately), Online Search with Google®, LED Signature Daytime Running Lights, 18-inch machined finished aluminum-alloy wheels, 8-way Power Driver Seat and 4-way Power Passenger Seat, Dual-Zone Automatic Temperature Control with front and rear vents, HomeLink® Universal Transceiver and more. 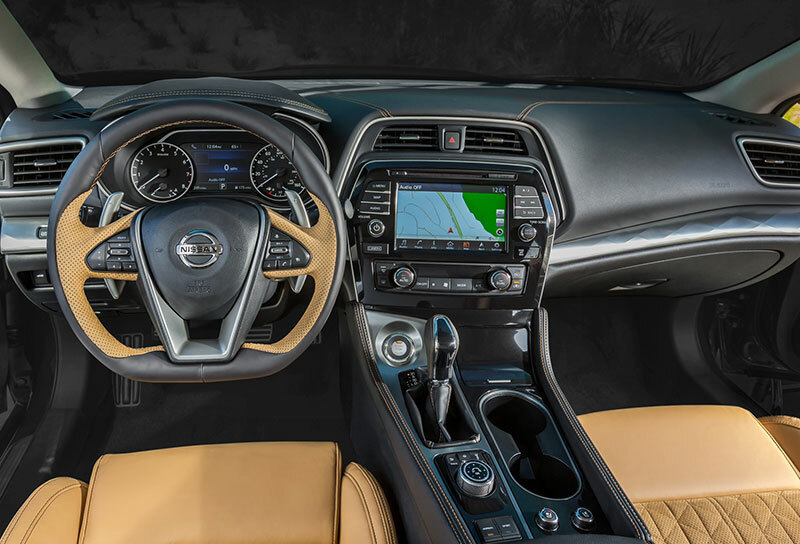 Maxima SV adds leather-appointed seating, heated front seats, driver’s seat power lumbar support and manual thigh support extension, front and rear parking sensors and heated outside rearview mirrors with turn signal indicators. Maxima SL adds the Dual Panel Panoramic Moonroof, Bose® audio system with 11 speakers, Predictive Forward Collision Warning (PFCW), Intelligent Cruise Control (ICC), Forward Emergency Braking (FEB), Rear Cross Traffic Alert (RCTA) and Blind Spot Warning (BSW), heated steering wheel and ambient lighting. This grade is notable for its long list of standard safety and driving aids that are typically found at a much higher entry price point on competitors. The Maxima SR offers a sport-tuned suspension, Integrated Dynamics-control Module (IDM), a front chassis performance damper, premium Ascot leather-appointed seats with diamond-quilted Alcantara® inserts, Climate-controlled front seats, Ascot leather-appointed steering wheel with Alcantara® insert, paddle shifters, aluminum sport pedals, Liquid Chrome faceted finishers, LED low beam headlights, 19-inch diamond-cut machined aluminum-alloy wheels and 245/40R19 all-season tires developed uniquely for Maxima. Finally, the new Maxima Platinum grade includes an extensive array of premium equipment, including Dual Panel Panoramic Moonroof, power tilt and telescoping steering column with easy access feature, premium Ascot leather-appointed seats with diamond-quilted leather inserts, premium Ascot leather-wrapped steering wheel, Around View® Monitor (AVM) with Moving Object Detection (MOD), rear window power sunshade, driver-side memory seat, outside mirrors and steering wheel, rain detecting windshield wipers, Driver Attention Alert, NissanConnect Services (subscription required, sold separately), mahogany wood-tone faceted finishers, auto-dimming driver-side outside mirror, and outside mirrors with reverse tilt-down feature. No options are offered on Maxima. Six factory installed accessories can be specified for additional customization and include splash guards, illuminated kick plates, premium spoiler, sport spoiler (SR only), 19-inch summer tires with full-size aluminum-alloy wheel spare (SR only) and unique 18-inch alloy wheels. The 2016 Nissan Maxima is assembled in Smyrna, Tennessee, with engines assembled in Decherd, Tennessee.